When teens at Democratic High School near Tel Aviv and at Talitha Kumi High School on the West Bank sit down for their history lesson, they-unlike many of their counterparts throughout the region-learn about Middle East history from two perspectives. First, they learn about the Six-Day War, the Balfour Declaration, and the Oslo peace accords from the vantage point of their mother country. Then, they learn about it from the perspective of their Israeli or Palestinian counterparts. On one level, this teaching approach-the project of two professors in Israel and Palestine-exposes youngsters from warring regions to one another's narrative in hopes that sowing seeds of tolerance might pay off in future political and social change. On another level, the project brings together educational leaders from Israel and Palestine in a collaboration that, while not always smooth, has already fostered a degree of communication and empathy. "We are trying this under very difficult conditions-the violence is going on, the (Israeli) occupation is continuing, the suicide bombers are there," said Dan Bar-On, a social psychology professor at Ben-Gurion University of the Negev in Beer-Sheva, Israel who helped create the project through the Peace Research Institute in the Middle East, or PRIME. "When the reality is very harsh, no such effort can outweigh the reality. But students do become much more sensitive to each other." In the midst of the Israeli-Palestinian conflict-one marked by lifelong biases, deep distrust, outright hatred, unspeakable acts of violence, an occupation that limits student movement and government policies that inhibit cross-border educational collaboration-it is a wonder that programs such as Bar-On's exist at all. But such efforts to open the lines of communication between Israeli and Palestinian educators, students and schools do exist, and they are a glimmer on an educational landscape often darkened by the strife within the region. Sometimes, these efforts operate virtually underground, with participants reluctant to publicize their efforts for fear of reprisals. At times, they take the form of a student's postgraduate work, as he or she breaks new ground on educational bridges between the divided regions. Or, the effort may not be in Israel or Palestine at all, but instead at institutions abroad as academics who travel and study the Middle East educate others about how the conflict has influenced higher education. Israel and Palestine have two distinct systems of higher education. Israel's is far more established, with the majority of institutions having been around at least six decades. When the state of Israel was created, there were only two institutions of higher education in the region-the Technion and the Hebrew University of Jerusalem. An increase in population, as well as advancements in economic and social development, created a demand for higher education, which led to the opening of five new universities during the 1950s and 1960s. The 1970s saw the establishment of teacher training colleges and the state-supported Open University, which offers undergraduate courses by means of long distance teaching. In the 1990s, there was a move toward diversification, with the opening of colleges devoted to technology and other specific professions or disciplines. Today, the higher education system in Israel comprises eight universities, 24 academic institutes for teacher training, and several academic programs at regional colleges. Some are state supported and others charge tuition. The campuses reflect the influences of Western Europe, the student body is international, course offerings are healthy and post-graduate degrees are offered in a wide array of disciplines. In 2002 the student body at Israeli's higher-education institutions numbered slightly over 180,000, not including the 36,710-student Open University, according to the Council for Higher Education, the licensing and accrediting authority for higher education in Israel. In addition, some 9,000 Israeli students study through extension courses offered by universities and colleges in the United States, the United Kingdom, Europe, and Africa. By contrast, the Palestinian higher education system is relatively young, with nearly all institutions established after 1971. There are 11 Palestinian universities, five university colleges and 25 community colleges in the West Bank and Gaza Strip. Enrollment has increased steadily, with the Palestinian National Authority's Ministry of Planning reporting that in 2002, more than 83,000 students were enrolled, with a student body split about evenly between men and women. But the current Israeli occupation is a constant and frustrating theme for Palestinian students and faculty. Campuses are closed during sieges and curfews, and some have been turned into Israeli military bases. Students are often detained and deported. There are more than 700 Israeli checkpoints and other military obstacles across the West Bank. Israel has completed about one-third of a 730-kilometer wall, or "Separation Barrier," that has divided and isolated Palestinian areas and cut off some 22 localities from their schools. As a result, transportation is a severe problem for students and faculty: A checkpoint on a West Bank road can shut down teaching for days. A 15-week term can be compressed into fewer than 12 weeks, or strung out over seven months. Some students cannot commute between school and home because of the unpredictability of the checkpoints. Some stay in the town next to the university, but living away from home increases the cost of their education. About eight in 10 Palestinians report difficulties in going about their daily routine, including getting to their universities, according to a May 2004 survey by the Palestinian Central Bureau of Statistics. Birzeit University, for instance, was once a national institution drawing students from all over the West Bank and Gaza. But detainments, deportations, checkpoints and the wall have changed that. In 2000 there were some 350 Gazan students at Birzeit University. Today there are 35. By 2004 new students coming to Birzeit from the northern West Bank town of Jenin had declined by 100 percent. Because of the violence in the region, Palestinian institutions of higher education have also suffered serious human tolls, with 24 teachers, 194 students and seven employees killed and 1,245 students injured. Material losses have reached nearly $5 million. The result is that university and college resources-libraries, course offerings, research opportunities and the offering of higher degrees-are in many cases diminished. While several Palestinian universities once had a substantial number of international faculty, the dire living conditions and income compression have led to a faculty exodus that has further weakened the schools. The student-to-teacher ratio has tumbled from one teacher for every 30 higher education students in 1998 to one teacher for every 40 students. Some institutions now rely on a high percentage of part-time or unqualified instructors. 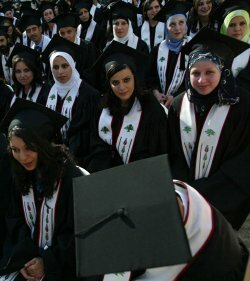 The proportion of those graduating from Palestinian universities is small. During the latest year for which the ministry has statistics on enrollment and graduation rates, data indicates that only about one of seven university students went on to graduate, while fewer than half of community college students graduated. Money remains a serious obstacle. A 2003 World Bank report states that "Palestinian institutions face the worst financial crisis over the last thirty odd years, and their continued operation without emergency assistance is in serious doubt." Most students do not have enough money for tuition, which covers 40 percent of the cost of their education. The Palestinian authority contributes 12 percent to 15 percent, and the university has to raise money for the remainder. "It breaks my heart to see these earnest young adults repressed as they try to pursue constructive strategies to improve their lives," said Beth Harris, an Ithaca College professor who belongs to Faculty for Israeli-Palestinian Peace, a network of Palestinian, Israeli and international faculty that opposes the Israeli occupation. "I think students do get discouraged by these circumstances, but those who are not in school get even more discouraged if they cannot find employment. It is very important to the Palestinian students that their campuses serve as a haven from these kinds of repressive intrusions, and thus for the most part, they do not welcome Israelis on their campuses." Harris was conducting research on the Palestinian resistance to the Israeli government's demolition of Palestinian homes when she stumbled on Faculty for Israeli Palestinian Peace, which tries to encourage Israeli, Palestinian and international faculty and students to work together, with the primary point of unity being opposition to the Israeli occupation of Palestine. The group organizes symposia at U.S. universities, where experts discuss the situation in the Middle East; sponsors Israeli and Palestinian faculty to speak on U.S. campuses; and sends delegations to lobby in Congress. Its members form fact-finding delegations to Israel and Palestine that report on the status of higher education in both regions. During one 2004 delegation to the Middle East, Harris said, "It became clear to me that the professors play a major role in helping students to place their lives in broader contexts, just as I do, but from a very different location in global politics." To the extent it is possible, Harris said, the universities do their best to create an oasis for their students despite the conflict that surrounds them. "But this isn't always possible," she said. "The students who have been killed or imprisoned are remembered by all. At Bethlehem University, beautiful new buildings have been seriously damaged by Israeli assaults. The threat of invasion of the campuses is ever present." Many Palestinian educators contacted for this article-including Bar-On's Palestinian counterpart on the PRIME project, Sami Adwan of Bethlehem University in the West Bank-did not reply to requests for interviews. It is clear that the animosity so pervasive in the region has permeated even institutions of higher education, where one expects a mindset willing to contemplate and analyze the divide, rather than merely react to it. Musa Isa-barhoum, head of public relations for Al-Quds Open University, noted bitterly that the wall between the two regions "is not a dividing wall between two parties," but "a wall to rob, confiscate and steal more of the Palestinian land." While his university's main office is in Sheikh Jarrah, in East Jerusalem, "we cannot reach it as Palestinians, and we are operating from a Ramallah office," he said. "The Palestinian people don't need seminars, degrees or cultural programs to stop the wall," Isa-barhoum said. "(The region) needs a significant change in the attitude and the behavior of the U.S. bias and one-sided policies." Such distrust permeates the higher educational system in Palestine. Open collaboration between Palestinian and Israeli universities tends to be prohibited. Israeli schools have a limited number of Palestinian students, and in many Palestinian schools, there are restrictions against Israelis setting foot on campus. It is virtually impossible to get government grants for Israeli and Palestinian universities to work together. "One way of keeping some semblance of control and protection within Palestinian universities is to demand that no Israelis come on campus," Harris said. "Some Israeli student activists feel rejected by this policy. They want to reach out, but in reality the Palestinians academics have not received substantial support from Israeli peace activists, including students and professors, when they faced arrests, imprisonment, closures (and) curfews." Nonetheless, collaboration does happen. Typically, it happens with the help of groups such as PRIME, which was established by Palestinian and Israeli researchers to pursue peace-building through joint research and outreach. The group, according to its Web site, focuses on teachers and schools as the critical force "over the long term for changing deeply entrenched and increasingly polarized attitudes on both sides of the Palestinian-Israeli conflict." Perhaps PRIME's most ambitious project is one that tries to soften the battle lines of the Israeli-Palestinian conflict by changing the way the conflict is taught. In 14 schools attended by Israelis, Palestinians or Israeli Arabs, Palestinian teens are exposed to Israeli history lessons and Israeli students to the Palestinian version of history. Booklets written by teams of Israeli and Palestinian historians put these competing versions of history side-by-side. "You have two different narratives dealing with the same event," said Eyal Naveh, a professor of American and European history at Tel Aviv University who leads the team of Israeli high school teachers in the PRIME project. "We want our students to know that, yes, these two sides look at the same historical event from a different perspective." Naveh's counterpart in Palestine, a professor at Bethlehem University, leads the team of Palestinian high school teachers. He could not be reached for comment. The project requires extensive training of teachers, who must learn how to defend two narratives in front of their pupils-one the students are accustomed to and the other they tend to find alien. "It's not an easy task for teachers to do that, and to have the effect of children being willing to be open and to listen," Bar-On said. Indeed, it is not an easy undertaking in a region where many thousands of children, university students and teachers have been arrested, injured or killed-some inside their classrooms-and where hundreds of schools have been damaged by shelling or other attacks. Moreover, some Palestinian parents don't believe their children should learn Israel's version of events, nor vice versa. Many Israeli parents have taught their children, for instance, that the 1967 Six-Day War between Israel and its Arab neighbors was a preemptive strike. Palestinian parents, meanwhile, tend to tell their children that it was a war of aggression by Israel. "Many of the children react to the reality, and not to the information," Bar-On concedes. "But we also were surprised to find quite a few children who were open to it and willing to listen to the other narrative. They didn't know the way the other side was reasoning, and some children even say, 'We would like to meet children from the other side.' The data were encouraging." Even the writing of these dual narratives can prove trying. There can be moments of tension and conflict among the researchers, particularly when negotiating how to word historical events that hold different meanings for Israelis and Palestinians. "Each meeting, sometimes it's very difficult, but at least we keep the dialogue going," Naveh said. "The only restriction we have is to avoid coarse language against the other." There are other such efforts to promote empathy between Israeli and Palestinian students. Al-Quds University lies in a suburb of East Jerusalem and is surrounded by an eight-meter-high concrete wall cutting it off from 36 percent of its students who live on the Jerusalem side of the wall. Nonetheless, administrators and some faculty at Al-Quds periodically work on common projects with Israeli professors-largely because of the conviction of university president Sari Nusseibeh. But this coordination upsets many students, while some professors tend to have mixed opinions about it. At Ben Gurion University, 25 Israeli and Palestinian graduate and undergraduate students participate in a workshop in which they are asked to interview parents or grandparents about their lives, then share those narratives with classmates. Through the Palestinian students' stories, some of the Israeli Jewish students learned for the first time what had happened to Palestinians in Israel since the creation of the Israeli state. Some of the Palestinians told stories of family members who were refugees during the 1948 war. Some described the period under the military regime in the 1950s and 1960s. Others emphasized what current daily life was like for members of an underprivileged minority in Israeli society. Similarly, the Jewish students told of grandparents who lived through the Holocaust and of others who had immigrated to Israel, some out of necessity and hardship because they were refugees whom no other country was willing to absorb. The Jewish students talked about the difficulties that these family members had in adjusting to a new society, and of wars and heroism of family members. The facilitators' notes of these sessions showed that Palestinian students first responded by criticizing some of the Jewish stories as being biased: In their perception, the Jewish students emphasized their family's suffering or heroism, but excluded the Palestinians' suffering and heroism and the Palestinian perception of the past. As one student said, "We have heard so much about your Holocaust, but where are our grandparents' stories of suffering caused by Israeli-Jews? Why do these aspects of the past not appear in your stories?" But there were breakthroughs: Eventually, it became clear through conversations and journal entries that the Palestinians had listened closely to the Jewish stories with which they could identify and toward which they felt empathetic. For example, their journals showed that some could identify with the story told by one Israeli student about her father who had immigrated from France, and who still does not feel at home in Israel. One Palestinian student reacted by saying that she, too, did not feel at home in Israel. Thus, the common image of rootlessness elicited feelings of empathy and openness on both sides. Similarly, when one Palestinian student described how her family avoided evacuation from their hometown in 1948, but then was forced to live in a ghetto, a Jewish student responded that her father had grown up near the same ghetto, but that he used to describe it favorably. The Jewish student's journal entries indicated that the Palestinian story forced her to reexamine the stories she had heard from her father and the reasons for the discrepancies that existed in the way he had constructed the past. When these students left the seminar, Bar-On said, "they listened differently to the news, they were more open to defend statements and attitudes of the other side in front of their friends, and some of them become engaged in facilitating workshops themselves." Another collaborative study between Israeli and Palestinian researchers examines the educational and psychological toll that political violence has had on teens in each region. The study, a project between three teams of researchers, includes 500 teens from the West Bank and Gaza Strip, 500 Jewish Israelis from major cities, and 500 Israeli-Arabs from major villages and towns. The goal of the research is to develop models of family and community intervention to help teens and their relatives cope with political violence and its aftermath. Things do not always go smoothly. The collaborators have held a few meetings, but because of Israeli-imposed curfews, Palestinian collaborators could not attend a mid-March gathering held in Beer Sheva. Instead, the researchers conducted the meeting by video-conference. "This situation can be an example of an obstacle that is encountered when being involved in such a collaboration," said Alean Al-Krenawi, one of the collaborators who is also chairman of the Spitzer Department of Social Work at Ben Gurion University. "Fortunately, nowadays, technology helps us to bridge such obstacles. This study proves that such bridging can exist." Harris agrees, but she says it is not always easy for educators, particularly those in Palestine, to accept such conditions. "As an academic, the ability to travel to conferences and do research is very important to me," she said. "There is a difficult dilemma that Palestinian educators face. On the one hand, they do not want to accept the conditions of occupation, checkpoints and the Separation Wall…as normal and adapt to these constraints by doing distance learning and video conferencing to expand contacts. On the other hand, if they are going to meet their students and their own immediate needs, they have to use some of these strategies." Al-Krenawi is also a board member for "Imagine: Expressions in the Service of Humanity," an international conference held in Tel-Aviv and Jerusalem this April. The conference assembled academics in psychology and psychiatry, in education, the arts, and the social services to examine how living in the Israeli-Palestinian region impacts the human condition. Such collaborations tend to spawn friendships and mutual respect between the Israeli and Palestinian researchers. Not only do the researchers share a sense of purpose, they also share a common recognition that they could face repercussions for their efforts. Such programs tend to operate underground to an extent, as they are not sanctioned by government education authorities, nor are educational materials-such as the PRIME narratives- part of official curricula. Proponents avoid publicizing their projects for fear state education officials might quash their efforts. Naveh, for instance, tries to introduce the dual-narrative concept to students at his university's College of Education. But he does not do so in class. "I just familiarize my students with the project and sometimes, I make a special discussion about it, but I don't teach it as part of my curriculum," he said, adding that because the PRIME project is "done without official approval," this can be especially problematic for his Palestinian counterparts. "It does not go with the official curriculum approved by the Minister of Education," Naveh said. "Here and there, we can do it as an extracurricular activity. We don't publicize it in the high-profile media. We simply keep a low profile and hope we will continue our project." The Bush administration's Middle East Peace Initiative (MEPI)-a relatively new program launched in 2002-works closely with USAID on educational challenges facing students in the Middle East. Israeli and Palestinian students participate in several of the MEPI's education programs, including: Student Leaders Study of the United States, which teaches leadership and entrepreneurial skills; Arab Civitas, which teaches students how to be effective, articulate, persuasive and civic-minded members of their communities; and the ACCESS Microscholarship program, which helps Palestinian youth with English language training through a curriculum emphasizing civic engagement and democratic principles. Additionally, Al-Quds University is participating with the University of Michigan-Dearborn in the MEPI's University Partnership program to link teaching and research. "We have already have seen a number of programmatic successes," said a senior U.S. State Department official who asked not to be named. "Among them are our efforts to ensure young people, especially girls, have the opportunity to receive an education that will enable them to participate as active, positive members of society, think critically, advocate persuasively and contribute effectively to the development and running of democratic processes." Noga Einy is a 26-year-old postgraduate student living in Jerusalem and studying at Ben Gurion University. For her thesis work in social psychology, she is studying Israeli teens' reactions to the PRIME booklets, while her Palestinian colleague, Niveen Eid, studies Palestinian teens' reactions. At a high school in Tel-Aviv, Einy and her two research assistants divide Israeli teens into two groups-with half assigned to debate the Israeli narrative regarding the events of the 1948 war in Israel, and the other half assigned to debate the Palestinian point of view. "The idea was to see how the pupils representing the Palestinian point of view are doing their assignment, and if it's possible for them to represent a point of view which they don't believe in," said Einy, who finds that the teens tend to already know the Palestinian point of view fairly well. "It was very interesting to see how they were able to do it, but also how they were glad to go back to being themselves again." Some of the teens' reactions, of course, are far from empathetic, Einy says. Some pupils don't understand the Palestinian point of view, or they refer to it as lies or exaggerations. At least one refused to represent the Palestinian point of view in debates or role-playing, and some who agree to do so find it difficult. But Einy was particularly struck by what happened one day during a role-playing exercise in which some teens assumed the identities of Palestinians. One Israeli boy, who was representing the Palestinians, tried to explain to the others why the Palestinian people refused a United Nations plan for dividing the lands between the two people, even though the Palestinians would get a larger part of it. "He said, 'If I was coming to your house, and asked you to give me 25 percent of it, but you could keep 75 percent for yourself, how would you react?' " Einy recalls. "This kind of complex way of thinking represents this boy's ability to deeply understand the other point of view, and how to translate it into an example emphasizing the importance of the concept of 'home'. Maybe he doesn't agree with it, but… he has the ability to represent the other (point of view) in such a deep way." Read the entire issue of International Educator at www.nafsa.org/ie. Articles may not be reprinted without permission from the publisher.